The Hempstead Plains Gallery, 1904-1913. This original Bleriot, one of the oldest airplanes in the world, is perhaps the greatest treasure in the museum's collection. Although underpowered and unstable, like all early planes, this was the most famous and successful of the pioneer aircraft. Developed by Louis Bleriot in France, the type achieved fame when on July 25, 1909 Bleriot made the first aircraft crossing of the English Channel in one. This Bleriot, originally purchased by Rodman Wanamaker, was the first aircraft ever imported into America. Bleriot's were the most common aircraft seen on Long Island between 1910 and 1912 and they were also the first type of aircraft manufactured here. 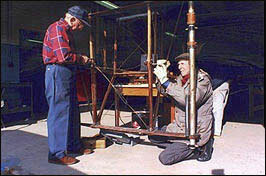 Bleriots were also the type of plane used by the Moisant School at Mineola, one of America's earliest flying schools. Specifications: Wingspan: 28'6", Length: 25'5", Top Speed: 45 mph, Engine: 30 hp Anzani, Weight 661lbs. 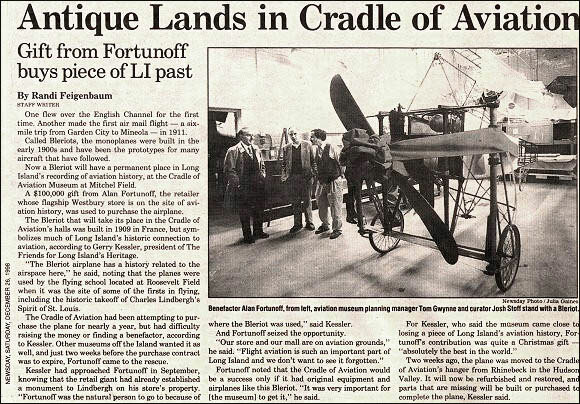 Thanks to a $100,000 gift from Alan Fortunoff, the Cradle of Aviation Museum purchased an original Bleriot XI monoplane from Old Rheinbeck Aerodrome. This original Bleriot (#153) is one of the oldest airplanes in the world. Much like all early planes, it was underpowered and unstable, but it was the most famous and successful of the pioneer aircraft. Developed by Louis Bleriot in France, the type achieved fame when on July 25, 1909 Bleriot made the first aircraft crossing of the English Channel in one. Bleriot #153, originally purchased by Rodman Wanamaker, was the first aircraft ever imported into America. Bleriot's were the most common aircraft seen on Long Island between 1910 and 1912 and they were also the first type of aircraft manufactured here. Open Tuesday through Sunday, 9:30-5:00. Open on Mondays that fall on holidays and school breaks. Combo includes the museum and a single Planetarium or Dome Theater show.